Plans to close a busy arterial road in County Fermanagh for four months will have a devastating impact on summer trade, local businesses have warned. 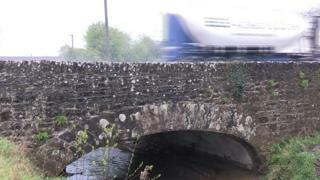 The Department for Infrastructure said the £350,000 scheme to replace Majors Bridge on the A34 Lisnagole Road is necessary after weaknesses were detected during a routine inspection. The road is the main route between Lisnaskea and Maguiresbridge. One lane of the road will be closed from 29 April. That will be followed by a full road closure between 6 May and 31 August. Traders in the nearby Lisnaskea Business Complex said they had not been consulted and have only been given three weeks' notice to prepare. Seamus Smith, of Quay Garden Structures, said 60-70% of his business relies on passing trade. He fears the roadworks could force him to close. "There's been no negotiations whatsoever on this and I think this is totally wrong," he told BBC News NI. "They should have been talking to the people for the last six months. "It's not just me, there are multiple other businesses here depending on summer trade." He said businesses like his need to be accommodated and he is calling on the Department for Infrastructure to postpone the work until October. "The bridge has stood there for the last 200 years. I don't see why three to four months postponement to allow us to survive can't be worked on, rather than closing us down completely," he said. "We've no government, we've no nothing, nobody to talk to, no MLAs to talk to, it's a serious, serious situation in this country. "We're all standing together on this, because we're all worried. There are multiple businesses in here depending on summer trade and we're all in the same boat." The Department for Infrastructure is to hold a public consultation at Lisnaskea Business Complex at 12:30 BST on Tuesday. In a statement it said: "During a routine bridge inspection in July 2017, excessive deflection of the arch barrel was observed when under loading by HGV vehicles. "Following further monitoring and assessment, the road was closed to one-way traffic for a short period while temporary strengthening works were undertaken. "This interim measure allowed the road to be reopened to two-way traffic while the design and procurement of a replacement bridge was progressed. "The exiting masonry arch is due for replacement and this scheme, which will upgrade the bridge to current design requirements, will include the widening of the carriageway and provision of a new cycle path and footway. "Due to the nature of the works and to ensure the safety of the road users and workers, it will be necessary to close Lisnagole Road while the new bridge is under construction." The department said that diversions via Nutfield Road will be signposted from Lisnaskea and the A4 Belfast Road. "Access will be maintained for local residential and business traffic," it said.